If you want to get to “yes” efficiently and effectively, this course is exactly what you need. We teach participants a method for defining and analyzing an idea as well as how to successfully create, communicate, and gain support for initiatives through the application of an efficient, effective analytical approach. 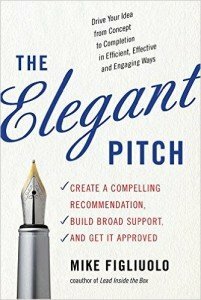 Mike Figliuolo’s book The Elegant Pitch: Create a Compelling Recommendation, Build Broad Support, and Get it Approved is based on this highly-rated program. What do our clients think of the course?